Introducing a new signature Blue Floral series titled "The Vows". This new print collection illustrates the power of loyalty between two people when they join together for the rest of their lives. They were designed to beautify the home as well as reflect the magic of marriage. Collect as individual, pairs and even the whole series. Perfect for gifting as well as anniversaries. Cyber Monday Sale Starts Now!!! My newest design titled “Made in the Las Vegas Arts District” is now available on shirts. I wanted to design something that captured the unique aesthetic of the neighborhood that has some of the most creative minds in Las Vegas. This is my newest painting titled “The Cycle of Life”. The Cycle of Life is very challenging. You always have to be prepared to pedal through the situation no matter how difficult it may seem. 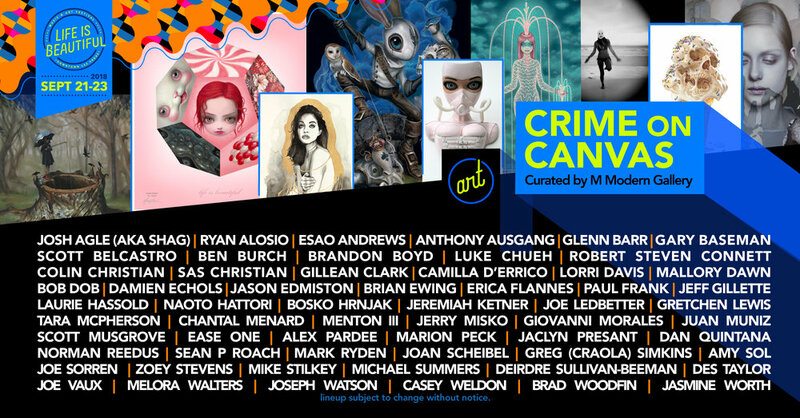 Glad to be included on this incredible lineup. I recently had the pleasure of completing a commissioned painting for Smith's Marketplace / Kroger in the Skye Canyon area of Las Vegas. It measures 14'x5'x2" and painted with acrylic on custom constructed wood panels. It is now on permanent display in the dining area. This was a challenge to paint, but I had lots of fun along the way! This is a book cover that I recently completed for Rebellion Publishing. It is for the "Not So Stories" book. New gallery developments and announcements coming soon! We are sorry for the delayed updates. We will be making some exciting gallery development announcements and updates shortly! Thanks for being patient. For the next three days, make sure to check out my new painting titled "Instrumental Flight" at the Crime on Canvas group art show taking place at Life is Beautiful. JW. Tell me about one of the pieces. BM. One of my personal favorites is, Las Flores del Jardín EstánMuertas. Which translates to The Flowers in the Garden Are Dead. I was in my first semester at CSN coming home on the bus one afternoon, just slowly realizing everything that was part of my life in high school was slowly fading away. I was stressing over a long-term relationship, stressing over school, stressing about whether art is the route to take or not, and doubting myself at every corner. I remember feeling a numbness that overpowered my whole body, and this painting was my interpretation of that moment. The black was used to silhouette the portrait in order to represent that overpowering feeling. There is also brighter colors in the painting, only because I wanted to represent the beauty that is life. Sometimes we feel engulfed by our own life issues, and forget we even get this chance to live one. This idea had been in the back of my head for so long, and it was awesome getting to finally put paint down and make it come to life. The Joseph Watson Collection presents the solo works of painter Brian Martinez in a show titled “20”. Preview night is August 31, 6-10pm and will be on display throughout the month of September. The title of the show represents the age of the artist and the importance of the beginning of young adulthood. At this stage in life, the mind is activated into choosing a path to achieve monumental goals, self identity, and purpose. Join us for an evening of paintings by Brian Martinez and being part of the creative journey as it begins. This digital version can be viewed on the 95 freeway and Las Vegas Blvd. Recently, I have been announced as one of the seven winners of the #ArtPopLasVegas billboard competition. The 2nd billboard is the printed version and can be seen on Arville and Desert Inn street in Las Vegas. It is 48' x 14' and absolutely stunning! 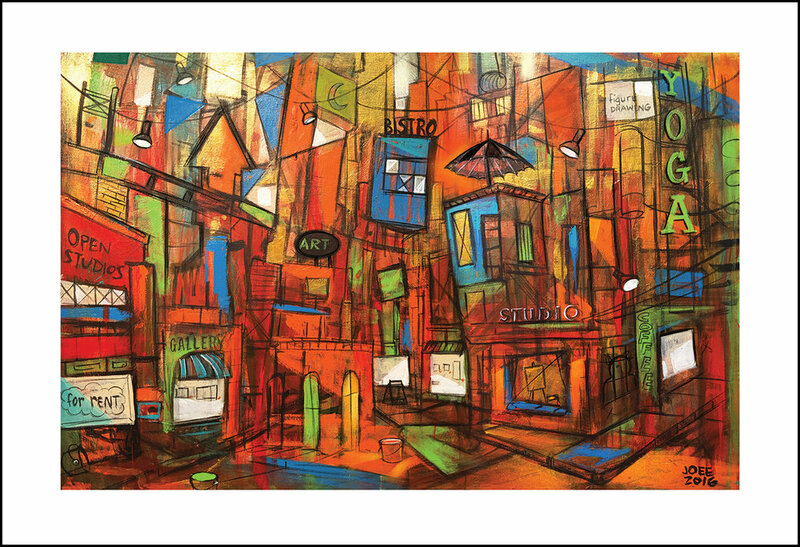 The Music District piece is now available as a signed, framed hand embellished giclee. Available size is 8"x10". I am all prepared to start painting my 6th sculpture for St. Jude's. It will be auctioned to raise funds for children in medical need. I am so excited and will share my entire process. These prints are now available for collecting. I will post some of my new paintings shortly. There is a great public art project that we will share soon!!! We are releasing a new follow up print based on our best seller "Urban Flora Collection". Joseph Watson titles it "Urban Flora Collection Series II". It features twelve unique survival flowers that each have a compelling story to tell. Check our online store at the end of the week for purchasing. Joseph Watson Gallery Wear is now available! Finally, you can wear Joseph Watson's inspirational imagery on apparel. Women's sizes. Our designs are sized just right to be seen when wearing jackets, blazers, etc. Visit the Gallery Wear section to purchase. Take advantage of our Cyber Monday sale and save now!